A short-range, wireless technology that is more energy-efficient than Bluetooth has been unveiled by Nokia. Wibree is a new radio frequency technology that can work alongside Bluetooth but using just a fraction of the power. Bluetooth is commonly found in mobile phones, printers and laptops and is used to transfer data. "It's up to 10 times more energy efficient than Bluetooth," said Bob Iannucci, Nokia Research Center's head. More than 500m devices currently contain Bluetooth technology. Nokia has been developing Wibree for the last five years and will now put the technology through a standardisation process so that the wireless system can be offered to third-party firms. "Our aim is to establish an industry standard faster than ever before by offering an inter-operable solution that can be commercialised and incorporated into products as quickly as possible," Mr Iannucci said. Wibree radio chips - which operate over a distance of 30ft (10m) - are also smaller than Bluetooth chips and will suit devices which up to now do not typically have wireless technology built-in. Watches, health monitors and sport sensors are three of the uses touted by Nokia. The technology is also likely to be used in mobile phones to help prolong battery power. The new wireless system can transfer data at speeds of up to 1Mbps, about a third of the speed of current Bluetooth technology. 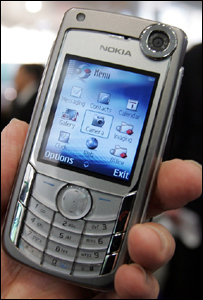 Nokia said it expected the first commercial version of the standard to be available during the second quarter of 2007. The firm said it expected dual Bluetooth-Wibree devices such as mobile phones to hit the market within two years. "The challenge is getting industry-wide support for yet another wireless standard, given the overwhelming number of standards in play at the moment its hard to see how companies can justify the research and development commitment to all of them," wireless telecoms analyst Ben Wood at UK-based Collins Consulting told Reuters news agency. He added: "Bluetooth is clearly not suited to some of the cooler applications like intelligent jewelry, watches - a less power hungry, smaller, cheaper solution will open some interesting new opportunities." Global sales of Bluetooth chips are expected to be between 500 million and 550 million units in 2006, up from 317 million in 2005, according to market leader CSR. Bluetooth technology was invented by Ericsson in the 1990s and was given away to the market as an open standard.